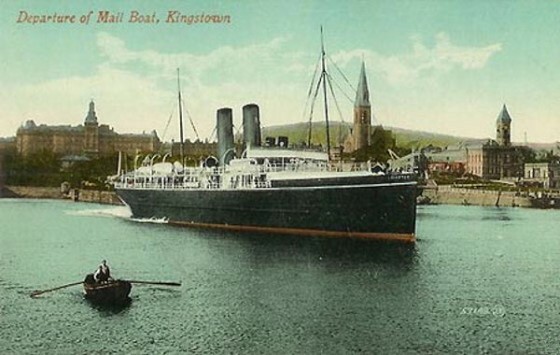 On the day in question, the Leinster left her berth in Dun Laoghaire, then called Kingstown, at 8.50am. Just after she had passed the Kish lightship some 7 miles out, she was hit by one torpedo at 9.50am. The ship was turned in an attempt to return to Dun Laoghaire but at about 9.55am she was hit by a second torpedo in the engine room and went down very quickly. The RMS Ulster had passed the Leinster a few minutes before the Leinster was hit, but the standing orders were that civilian ships were not to attempt to rescue survivors, as they would be a target for the submarine as well. The distress signal was passed by the Ulster to the Royal Navy, as the Leinster’s radio mast had been brought down. The destroyer HMS Liveley arrived after about an hour and a half, followed by the destroyers HMS Seal and HMS Mallard. The Helga, which had been used to suppress the Easter Rising in 1916, put to sea from Dublin and also took part in the rescue, as did tugs. Unfortunately, sea conditions on the day were poor being recorded by the RN ships’ logs as a wind speed of 6 to 7 from the south-west with a “very high sea” so that, although the lifeboats had been lowered, many had been swamped by the time help arrived. VAD Anne Barry is on the memorial at Brookwood cemetery in Surrey.There were 5 VADs killed on the Leinster. Josephine Carr was the first member of WRNS to be killed in action.She was a clerk from County Cork and is commemorated on the Royal Naval memorial in Plymouth.Her death gives added irony to the quirky motto for the WRNS “Never at sea”! The Irish War of Independence broke out between Irish nationalists and the British forces within a year of the sinking. It thus suited each side to deliberately forget the part played in WWI by Irish men and women.Irish officialdom wished to construct a myth of perpetual Irish struggle against British imperialism down the centuries, and the Irish serving in the British forces was an awkward fact to deal with.British officialdom sought to downplay the Irish contribution to WWI, not least because of the loss of the Irish republic but also to justify the behaviour of British politicians and forces in Ireland in the 1919-1921 period.Thus, the loss of the Leinster became part of the suppression of WWI memories on all sides. A lack of information about those who died has also played a part. The tragedy itself has been remembered in Dun Laoghaire and Holyhead to some extent but it is really only with the stories of the victims becoming known that true remembrance is possible. Of course, the work of Philip Lecane and colleagues at the Irish Maritime Museum and those at the Holyhead Maritime Museum has been central to this task. On 10th October, there was a commemoration in Dun Laoghaire near Dublin, of the loss of the "mail packet" RMS Leinster. Philip Lecane of the Maritime Museum in Dun Laoghaire had persuaded the Irish government to make it an official commemoration, which they certainly did. The current figure for the losses is 567, out of 771 passengers. Some 350 servicemen and women were lost including American, Canadian, New Zealand and Australian. Fourteen Royal Welsh Fusiliers (RWF) were lost and are listed here. In Holyhead, the maritime museum there has put on commemorative events, including a wreath laying on the 10th October. Twenty four crew from Holyhead were lost. In Dun Laoghaire, there was a reading of a Hedd Wynn poem by First Minister of Wales, Caerwyn Jones, and an address and unveiling of a new commemorative stamp by the Irish Minister for Culture, Josepha Madigan. There was an address from the head of the Irish Naval Service on his experience of rescue operations, good and bad. The head of the Irish postal service, An Post, told us that all postal workers in Ireland had stopped work 09.50 that day, the time of the disaster, to commemorate their lost colleagues - out of the 22 mail sorters on board, only one survived. Various family members of victims and survivors were there, both local and from far-flung places such as New Zealand and the United States. Ambassadors and military attaches were there from all the countries involved, inlcuing the lady military attache from Australia. Unbelieveably, the Maritime Museum in Dun Laoghaire has two letters from the RMS Leinster which had been recovered at the time, dried out and delivered - one to Canada and the other to Mincing Lane in the City of London. They are stamped as being damaged because they have been salvaged from the wreck of the RMS Leinster. The mail must get through! The link for Holyhead Maritime Museum is here. Philip Lecane has written two books on the tragedy - "Torpedoed The RMS Leinster disaster" and "Women and children of the Leinster". He and his collaborators are responsible for correcting the deficient records of the disaster. There were at least 21 Royal Welsh Fusiliers on board RMS Leinster - four officers and 17 men. They mainly served with the 3rd Battalion, RWF. Two officers and 12 of the men were lost. 8/R.W. Fus. Sgt 7283, R.W. Fus. 49068 Infantry Base Depot., 2/R.W. Fus., R.W. Fus. Infantry Base Depot., 2/R.W. Fus. First served in the Balkans - 29 June 1915. Previously in the army reserve. Buried at Llanllyfni (Gorphwysfa) Cemetery - 44. Yr Herald Cymraeg of 26 November reports his body was found at Abergele Sands. Family information suggests that his death was registered at Isle of Man. Buried at Grangegorman Military Cemetery, Dublin - Pres. 90. Buried at Grangegorman Military Cemetery, Dublin - RC Officers 24. Born at Llanfihangel , Anglesey. He was the son of Owen and Ann Rowlands of Llerniau, Llanfigael. Enlisted at Menai Bridge. IN 1911 he was employed as a Cowman on a farm, aged 15. Awarded the British War Medal and Victory Medal. Wounded at Mametz Wood 18th July 1916. Buried at Grangegorman Military Cemetery, Dublin - CE.Officers.27. Buried at Peel Green Cemetery, Lancashire - F. CE. 16833.